There are many different types of wisteria vines that grow in North Carolina, but only one species, the American wisteria, is native to the state. Wisteria leaves are distinct and identifying them is usually easy. But because various wisteria species have similarly-structured leaves, discerning one species from another can be challenging. You may need to study the vine’s other characteristics to make a positive identification. The most common types of wisteria vines that grow in North Carolina include the American wisteria, or Wisteria frutescens, the Chinese wisteria, or W. sinensis, and the Japanese wisteria, or W. floribunda, according to the North Carolina State University Cooperative Extension. There are also many hybrids of these wisteria species, as well as hybrids of wisteria and trumpetcreeper vines. Although most wisteria species are considered invasive, the American wisteria is less invasive than its Asian counterparts. A perennial climbing vine that loses its leaves in winter, the American wisteria has compound leaves with five to 19 leaflets. The entire compound leaf is at most 12 inches long, and each leaflet, glossy and dark green in color, is approximately 1 to 3 inches long. American wisteria vines are native throughout the Southeastern United States, from central Florida to eastern Texas and north to southeastern Virginia. In North Carolina, the American wisteria grows naturally throughout the coastal plain and piedmont regions. Look for the American wisteria growing in full sunlight to full shade, in moist areas beside streams and ponds, near or in swampy areas, and on fences or shrubs and trees. The American wisteria blooms during the spring in North Carolina with lavender-blue flowers arranged in clusters. The flowers begin to bloom in pea-shaped blossoms right after the leaves reemerge in the spring. The vine can grow rapidly up to 50 feet in length, and in late summer, it produces seed pods, tan in color, and approximately 2 to 4 inches long. The American wisteria grows in a multiple-stem form, and it climbs by “twining,” rather than using root hairs or tendrils like other vines. Don’t mistake the American wisteria for the other, more invasive species, which can be difficult to tell apart. 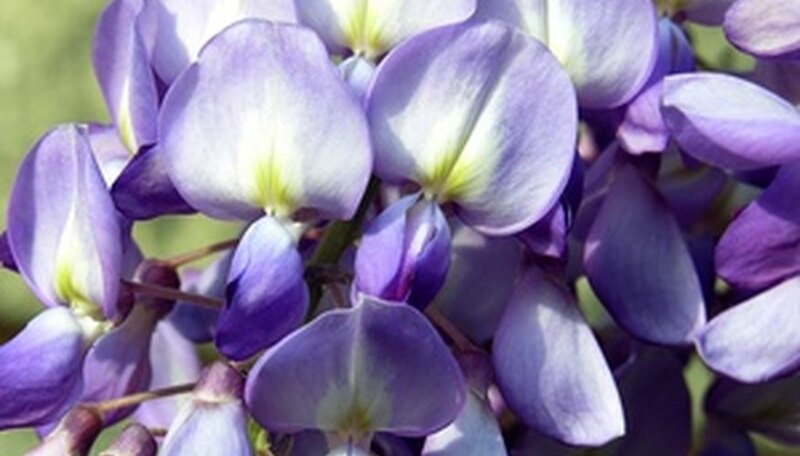 Both the American and Chinese wisteria have lavender-blue flowers, but the American wisteria’s flower racemes are shorter, usually only 6 inches long. The Chinese and Japanese wisteria often bloom earlier than the American species, frequently before all the leaves emerge, but the American wisteria can sometimes re-bloom throughout the summer season. Other species have fuzzy or “pubescent” seed pods, while the American wisteria has smooth pods. Chinese and Japanese wisteria vines can grow longer than the American wisteria – up to 70 feet – and they are much more aggressive. Unlike the American wisteria, you may see Chinese and Japanese wisteria growing in dry sites as well as moist areas.